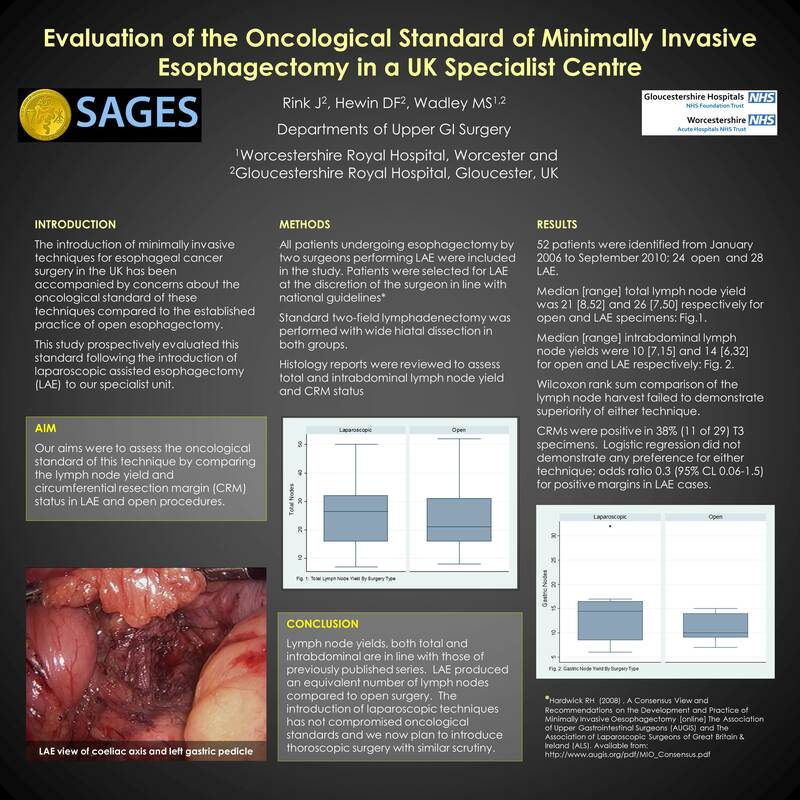 The introduction of minimally invasive techniques in esophageal cancer surgery in the UK has been accompanied by concerns about the oncological standards of surgery compared with traditional open surgical resection. The Association of Upper Gastrointestinal Surgeons (AUGIS) and The Association of Laparoscopic Surgeons of Great Britain & Ireland (ALS) have recommended that the rates of resection margin positivity and lymph node yields in MIE should be detailed for comparison with open surgery*. Following the introduction of MIE in our unit we aimed to assess the oncological standard of this technique by comparing these two variables in open and laparoscopically assisted esophagectomy (LAE). In line with UK recommendations we have first evaluated LAE before proceding to totally MIE. During the initial learning phase patients with BMI >30, previous abdominal surgery and locally advanced T3 disease underwent standard open two-stage Ivor Lewis esophagectomy (ILE). All other patients underwent LAE with open right thoracotomy and intrathoracic anastamosis. In both groups a standard 2-field lymphadenectomy was performed. Wide dissection around the hiatus was also performed with en-bloc resection of crural fibres and pericardial fat to minimise risk of circumferential margin involvement (CRM+). In the thoracic phase paraesophageal nodes were excised en-bloc with the thoracic duct. Histology reports were reviewed to assess intra-abdominal, thoracic and total lymph node yield as well as CRM+. 52 patients were identified from January 2006 to September 2010. 24 had open ILE and 28 LAE. Median [range] total lymph node yield was 21 [8-52] and 26 [7-50] respectively for open and LAE specimens. Median [range] intra-abdominal lymph node yields were 10 [7-15] and 14 [6-32] for open and laparoscopic procedures respectively. There was no significant difference between lymph node yield with either technique (Wilcoxon rank sum p=0.34). Circumferential resection margins were positive in 38% (11 of 29) T3 resection specimens. Again there was no significant difference in CRM+ in either group (Chi squared p=0.137) . The lymph node yields, both total and intra-abdominal, are in line with those of previously published series. LAE produced equivalent lymph node yields compared to open ILE. The introduction of minimally invasive techniques to ILE does not appear to have compromised the oncological quality of surgery. In light of these findings we now plan to introduce and prospectively evaluate thoracoscopy and total MIE in our unit.